The non-profit 501-c-3 Women’s Transportation Seminar Boston Charitable Fund, Inc. (WTS BCF), in coordination with the Massachusetts Department of Transportation (MassDOT) and the Massachusetts Bay Transportation Authority (MBTA), announces a Request for Qualifications for artwork to be located in the Red Line/Silver Line Concourse in South Station (Boston, MA). The winning proposal will feature a site-specific, permanent public art work to celebrate Women in Movement. Experienced, practicing artists and designers are encouraged to apply. Artists may work as individuals or teams, and may work in a variety of media. Excluded from participation are members of the WTS Boston Board, the WTS Boston Charitable Fund Board, and the Public Art Selection Panel. Boston is the birthplace of American mass transportation and the MBTA manages the fourth largest transit system in the nation. The MBTA has a long history of enhancing the commuter experience through public art and is home to the nation’s first art in transit collection and formalized art program which began in 1967. The collection has grown to over ninety pieces on six transit lines. Furthermore, the piece should be dynamic to reflect the theme and its location within one of the most prominent transit hubs in the City of Boston. WTS also considers “the spirit of community, inclusiveness, and mutual support… one of our greatest assets.” Candidates should demonstrate a collaborative style and willingness to work with project leaders to further refine concepts before fabrication. On January 1, 1899, South Station opened to the public as one of the world’s largest rail stations. It became one of the busiest in the country in the early 1900s. Today, South Station is a particularly significant location in the MBTA system, as it links urban, commuter, and regional transportation services and is a gateway into the city of Boston. South Station is second only to Logan Airport in New England in passenger volume. The Red Line/Silver Line Concourse includes approximately 23,000 square feet with two lobby areas. 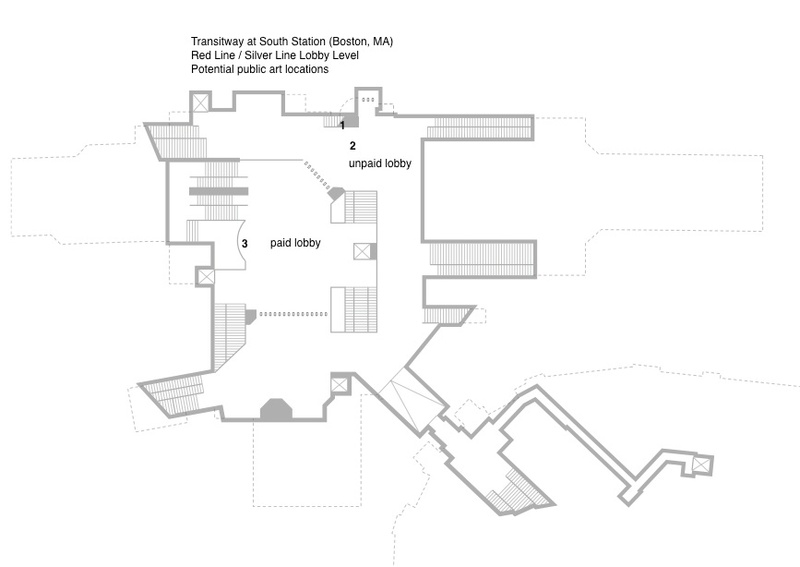 The outer “unpaid” lobby area is accessible by the public from the street and the South Station main terminal above, and from the Red Line below. The inner “paid” lobby area requires paid access through turnstyles for visitors to access the transitway platform below. The number of people passing through this Concourse area on an average weekday exceeds 57,000 and reached nearly 16.4 million total in 2013. Note: this is an RFQ, specific proposals are not required at this time. The following is provided for reference only. 1. The project must enhance a positive and welcoming environment to the public. 2. All artists must work collaboratively with the MBTA. Artwork can not conflict with transportation needs. 3. Artists will use the materials that provide levels of safety, accessibility, durability and maintenance requirements that are acceptable to the Authority. Work will be installed at locations approved by the MBTA. 4. Technical and artistic quality is the most important criteria. 5. Impact on the public will be optimized, and the product must enhance a positive and welcoming environment to the public. 6. Connection to the site and/or community may be expressed through form or substance, and can include interpretive natural and historic references, and/or abstract pattern to enhance the built environment of the station. 7. Suitability to the site includes both safety and understanding of scale in the station and urban environments. 8. Resilience, indestructibility and preservation requirements will be the same as for the station element being designed by an artist. Work must be durable, vandal-resistant, and require no additional maintenance. 9. Compensation of selected artists will be consistent with FTA standard fees or wages for procurement of design professionals (http://www.dol.gov/whd/govcontracts/dbra.htm). Compensation of youth and other community members will be based on their role on the project, and prevailing standards. 10. Promotion of specific private or corporate business interests in artistic undertakings is prohibited. Appropriate credit will be allowed. All artwork created under this Program belongs to the MBTA with proper credit due to the artist(s) and/or organization. The MBTA requires that each applicant grant the MBTA the right to a royalty-free, perpetual license to use any depictions of the artwork for use in any and all publications. The MBTA will credit the artist(s) and/or organization properly in these publications. The art budget is not to exceed $150,000. This budget includes all costs related to the artist’s project management fees; the artwork’s final design, fabrication, transportation, delivery and installation costs; subcontractor and consultant fees including any engineers or fabricators; permit and license fees; general liability and other insurance required by the MBTA, and all other costs associated with the project. Any expense that exceeds the contracted amount shall be the artist’s responsibility. In STAGE I (RFQ), Artists will submit their portfolios, CVs, and an artist statement. From this first round of submissions, a selection panel will select up to three artists who are most qualified for this competition. Artists are invited to a Q&A session July 1 to support their application. In STAGE II (RFP), Three finalists will each be paid an honorarium of $2,000 inclusive of presentation materials and travel. Finalists will be required to spend time with project leaders and stakeholders, and attend a site visit and de-brief with the MBTA prior to developing proposals. A site visit will be scheduled in September. Proposals will be due Nov. 19, 2014. Finalists are asked to develop site-specific proposals with a detailed project description including schedule and budget, scale models and/or renderings, and a 45-minute in-person interview and public presentation on Dec. 9, 2014. Materials will be displayed for public comment. The Selection Panel will recommend the winning artist for MBTA approval, with notification before Dec. 31. WTS Boston will conduct the Women in Movement application process online, with all materials submitted in digital format through the CaFÉ ™ website (www.callforentry.org). There is no application fee. (1) Introductory Statement: Briefly describe the artist or team, identify the proposed lead artist (if for a team) and contact information. Include three references with contact information. (2) Portfolio: Submit up to ten digital images total of current work (within the past five years). Only ten images may be submitted to represent an entire team. In the description of the image, accompanying annotation must include title, size, media, date of completion, budget, and a brief description of the artwork. Do not present more than one view of artwork per image. The selection panel will consider artistic excellence and achievement as evidenced by the materials submitted, as well as the relevance of previous professional experience to this project and experience with projects of similar scale and scope, including demonstrated ability to successfully collaborate with public agencies and address site specific conditions. (3) Resume/CV: If you are applying as a team, include all team member resumes within one document. (4) Artist Statement: (4,000 characters maximum). Describe the artist’s relevant experience, as well as the conceptual approach you would take to the Women in Movement Project. What is compelling about the project, theme, site, or community? Describe your experience working with public agencies. Preference will be given to applicants whose work shows innovative problem-solving and the ability to convey concepts clearly. The panel is looking for artist(s) who are able to take a novel approach to the project theme; artist(s) who will ultimately create a work that is responsive to the surrounding environment with the potential to engage and resonate within the community. Please note that specific project proposals are not requested at this time. WTS-Boston is one of the oldest and largest Chapters within the WTS International organization. WTS-Boston was founded in 1981 by a group of six women who wanted to “promote the education of professionals employed in the traffic and transportation industry.” WTS-Boston is now a member of WTS International which is an international network of nearly 6,000 transportation professionals, including men and women. WTS-Boston is 400 members strong and provides high-caliber professional development and networking opportunties to its members with the utimate mission of “advancing women in transportation."